A vaccine against HIV might prevent the disease that we can't seem to cure. Some HIV patients make antibodies that can take down the virus, much the way a vaccine might. But, scientists haven't been able to provoke that type of response in other people. However, in a process that might work in humans, a group of researchers has successfully generated antibodies in cows that neutralize multiple strains of HIV. Dennis Burton, of The Scripps Research Institute in La Jolla, California, and his colleagues found that immunization of cows with a protein similar to the envelope of the HIV produced broadly neutralizing antibodies to HIV. Until researchers do more tests on this approach, we won't know whether it will work in humans. The researchers published their study July 20 in the journal Nature. When a foreign microbe invades the body, immune cells called macrophages eat the invaders they come across. When macrophages digest microbes, they keep its antigens — pieces of protein from the infectious microbe — and carry them back to the lymph nodes where other members of the immune system reside. There, the macrophages 'present' — put the antigen out on its cell surface — the antigen to white blood cells called lymphocytes. This presentation helps the immune system to remember the infectious agent and attack it if it infects again. The two main types of lymphocytes that hold these memories of past infections are T lymphocytes and B lymphocytes. Killer T lymphocytes are cells that have seen the same microbial antigens in the past and release chemicals to destroy it. Helper T cells — also known as CD4 T cells — secrete chemicals that increase the immune response and that activate killer T cells and B cells to join the fight against the invader. B cells are the antibody-producing cells of the immune system. The antibodies they produce are unique and specific to the antigen. The antibodies stick to antigens on the invading microbe, marking it for destruction by the body. Vaccines trick the immune system into responding as if there is an actual infection, creating these types of defenses against an infectious agent without causing sickness. When microbes enter the body after vaccination, the immune system is primed to kick into action. Antigens that are unique to particular organisms present a great target for vaccines. Vaccines often create these defenses using weakened forms of virus — one that's unable to cause disease or replicate — that the body's immune system reacts to. The response by the immune system sets it up to fight the real microbe if it happens to enter the body by producing antibodies and activating T cells. So, why can't we just inject people with weakened HIV that will generate an immune response and protect them from getting a full-blown HIV infection? One reason is that there are four genetic variations — named M, N, O, and P — of the HIV-1 virus, with many subtypes within group M, the primary human disease-causing HIV. Another reason is that the antigens — carbohydrate and protein complexes called glycoproteins — on the viral surface keep mutating, even in a single patient. Specific antibodies made to the exact antigens probably won't work against mutated antigens. Some people infected with HIV have produced broadly neutralizing antibodies to it. This type of antibody attacks key functional sites in the virus and prevents them from infecting host cells. These antibodies recognize antigens from the HIV viral envelope — the outer membrane — a part of the virus that doesn't mutate. The problem with the broadly neutralizing antibodies that some patients have developed is that they don't generate a strong immune response and it can take years for that response to develop. Broadly neutralizing antibodies are the right time to make an HIV vaccine effective against the HIV and its ever-changing surface antigens. In the new research study by Burton and colleagues, the researchers injected four cows with a protein called BG505 SOSIP that was designed to mimic the HIV envelope. In a little more than a month, the cows developed broadly neutralizing antibodies against HIV. Antibodies produced by one cow after 42 days neutralized 20% of the 117 HIV subtypes tested. More than a year after immunization, this cow had created antibodies that neutralized 96% of HIV subtypes. Similar work has been done in llamas. Immunization of llamas with envelope proteins produced broadly neutralizing antibodies, but they were not very potent and did not persist more than four months. The rapid elicitation of functional responses against a difficult target like HIV Env suggests that cow immunization should be explored to rapidly generate antibodies against other pathogens that have evolved to avoid human antibody responses, such as malaria. Such antibodies, as well as their intrinsic prophylactic and therapeutic value, can help define targets for vaccine and drug design. The study in cows doesn't get around the problem that most humans aren't able to produce broadly neutralizing antibodies to an HIV infection. 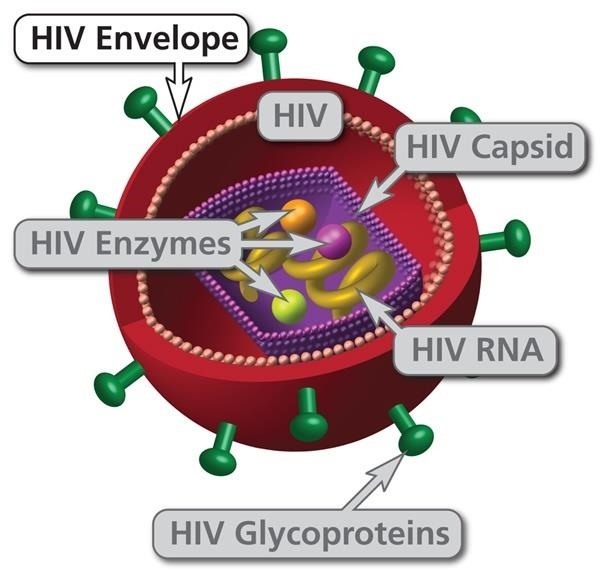 They may, however, be provoked by immunization with HIV envelope proteins — or a similar protein — to do so. Only time and more research will tell.